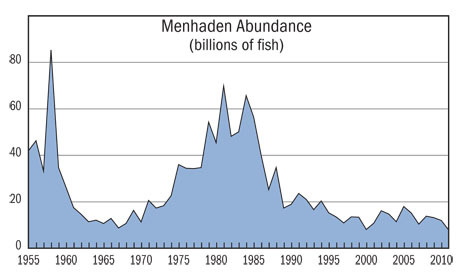 I’m encouraging every veteran angler to take a look at this graph, which shows the decline of Atlantic menhaden since the mid-1980s. Think about your own fishing experiences along this timeline. The data it reflects match up exactly with my own observations across more than 40-plus years of fly and light-tackle fishing. The Atlantic States Marine Fisheries Commission needs to close the fishery or at least make sufficient cuts in the harvest, before it’s too late for bunker. I have been fishing since I can remember. The first fish I ever caught was a weakfish at age four. Weakfish are an almost non-existent species these days in southern New England, no thanks to a combination of overfishing and poor menhaden stocks. Along with our current stocks of Atlantic menhaden their northerly and southerly range has shrunk. When I caught that weakfish, I was with my grandfather who passed his love of the marine world and fishing onto me. He would revel in stories of massive schools of menhaden that would choke the Niantic River mouth and adjacent Connecticut beaches and all the large striped bass and bluefish that would feed on them during the fall migration. By the time I was old enough to learn to fish, menhaden had already declined. But still what I enjoyed as a boy was impressive, compared to the sad state of things today. I remember the massive numbers in the late 1970s through the mid-1980s. Menhaden schools stretched from one side of Niantic Bay to the other. I stood at the point at McCook’s Beach in Niantic and all the water I could see, in every direction, was boiling with them as they were pounded by schools of 15- to 20-pound bluefish. I’ve not seen anything like that since the mid-1980s. The sad thing is how when I was a boy you heard stories of the “good ol’ days” and now with the situation worsening I find myself telling younger fisherman “good ol’ days” stories as I had witnessed. We are clearly headed in the wrong direction. Of course, my boyhood days growing up on Long Island Sound in Niantic, Connecticut coincided with the mid 70’s to mid-80’s peak in the “modern” menhaden stock. Besides stripers, blues and weakfish, giant bluefin tuna also came within a short run to feed on bunker. Over-fishing of those predators was a major problem in those days, and I’m very concerned about the downward trajectory of striped bass, weakfish and bluefin that we’re seeing today. But, their declines in the 80s and 90s were also related to a lack of forage—namely menhaden. Nothing provides them with a better source of nutrition than menhaden, which they need to eat to have the energy to make long migrations and to reproduce effectively. My fishing friends in Florida say the big menhaden pods have disappeared from southeast Florida while the pods are shrinking in size off East Central and Northeast Florida. Improved fish finding technology coupled with the recently increased demand for fish oil are strong contributing factors to the demise we see on the graph and on the water. The bait needs a break, plain and simple. It is time to “err on the side of the resource” and not some well-funded special interests with tremendous clout in the form of campaign donations. Both recreational and commercial fisherman, as well as those who derive their income from the waters of America’s Atlantic seaboard, depend on healthy stocks of menhaden in order to be successful. It is time to take a stand and do what is right and what is logical. Protect the menhaden from overfishing, period. Enough of this boom-to-bust fishing. Let’s set and enforce science-based annual catch limits that prevent overfishing on everything subject to harvest in state and federal waters. That way, we can make the “good ol’ days” the near future. John Kelly is a native of Niantic, Connecticut, and has fished in New England for more than 40 years. He has dedicated his life to fishing, and traveled extensively. 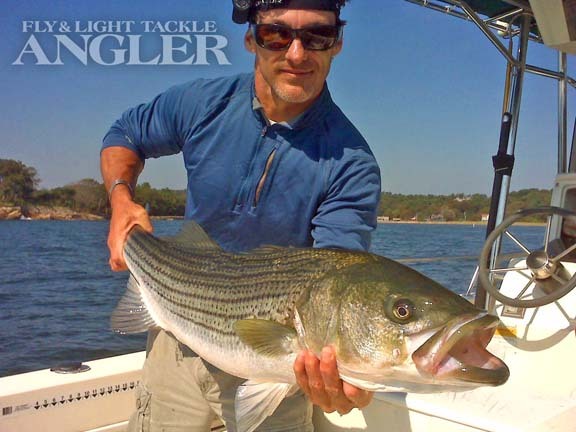 Fly & Light Tackle Angler is a bimonthly publication covering domestic and international fly and light-tackle fishing. Our emphasis is on coastal saltwater and warm, freshwater fisheries with occasional coverage of top coldwater destinations. As an app-based digital publication, FLTA promises delivery of highly interactive content to mobile device readers.